North America (September 21, 2017) – Elgood’s Coolship Sour Mango Ale – a tart, 6% ABV, spontaneously-fermented ale blended with mango for a bright and fruity flavor mélange, is now available nationwide in the U.S. The Sour Mango Ale is the first bottle release in the renowned Elgoods Coolship Series, formerly known as “Original Sour”, a collaborative project between head brewer Alan Pateman and Artisanal CEO Bob Leggett featuring 100% spontaneously fermented beers from a most unlikely source: a traditional British Brewery! Not just a kettle sour, Elgood’s uses copper coolships from the 1920s to cool their wort overnight. These traditional fermentation vessels are broad and flat with open tops – accelerating the cooling process while also inoculating the wort with a healthy mix of microbes. As the wort cools, it becomes the perfect home for lactobacilli, which are responsible for the bright sourness. Brettanomyces and other wild yeasts add earthy notes and saccharomyces cerevisiae, or brewer’s yeast, finishes the fermentation. This complex and symbiotic fermentation gives Elgood’s beers a depth and complexity of flavor that is just not possible any other way. It takes between 9 and 12 months for Elgood’s Sour Mango Ale to reach maturity, aging peacefully the whole while in stainless steel tanks to which oak and chestnut chips have been added. The result is a one-of-a-kind tart yet sweet ale – a combination of barrel-aged, spontaneously-fermented English “Cambic” (Lambic from Cambridgeshire) and fresh mango. Grain bill: British Pale Malt and un-malted wheat. Hops: Aged Styrian Goldings – low in aroma and bitterness, but very high in beer-preserving tannins. Blended with mango concentrate for a bright, sour and fruity flavor. Deeply complex lambic-like flavors harmonize with tropical notes. Lingering, mouth-watering acidity fades to a fruit-basket freshness. Unlike any other beer you’ve tried! 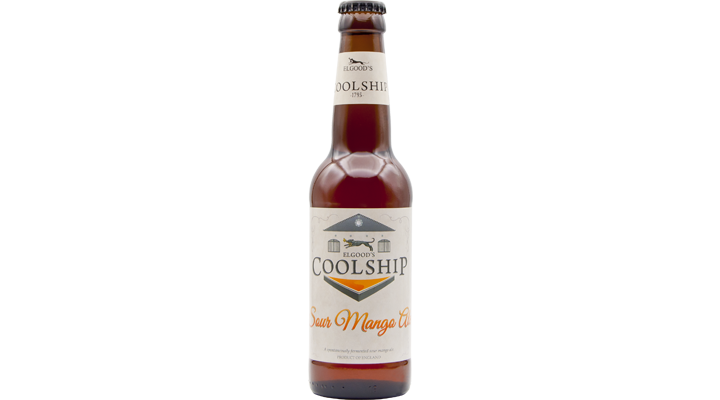 Interested in selling Elgood’s Coolship Sour Mango Ale in your retail store, bar or restaurant? Interested in becoming a distribution partner for Elgood’s portfolio of world-renowned British ales and lagers? Please contact Lanny Hoff with interest. For interview opportunities with brewer Alan Pateman, or for more information about the family-owned brewery’s heritage and handcrafted beer, please contact Lanny Hoff at +1 (612) 245-5433 or by email at lanny.hoff@artisanalimports.com. About Elgood’s Brewery: Elgood’s Brewery is family-owned and situated in the heart of ‘Fen’ country in Cambridgeshire, England. It was established in 1795, and is one of the first classic Georgian Breweries to be built outside London. Learn more at www.elgoods-brewery.co.uk.